Recently, We saw a leak of Mi Max 3. 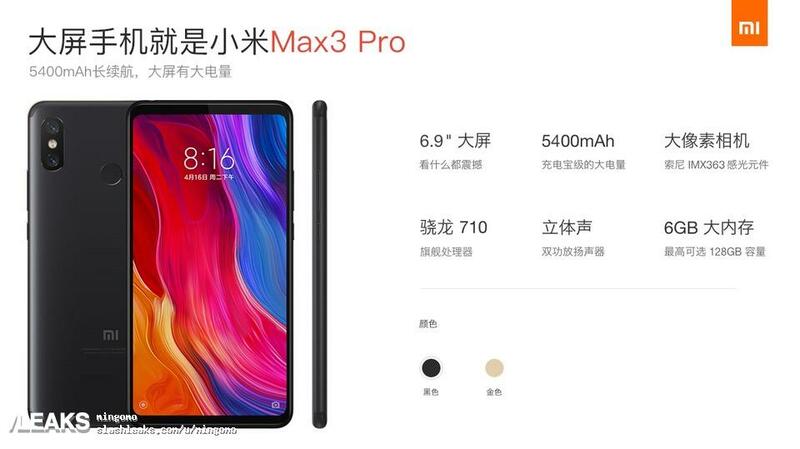 Now its pretty clear, Xiaomi will launch Mi Max 3 pro as well. As per what we can see in the leaks, It is going to have a 6.9-inch display. Mi Max 3 Pro will have Qualcomm’s Snapdragon 710 chipset. The phone will have 5,400 mAh of battery to give you long lasting Screen on Time. This might come with 6GB of RAM and 64GB or 128GB of storage options. The phone features dual camera at the back. These are oriented vertically as we see nowadays with other smartphones as well. The design looks almost inspired by Apple’s iPhone X. Talking about the display, It has 6.9-inch. The aspect ratio for the phone comes out to be 18:9, which is a trend nowadays. According to the leaks, It doesn’t feature a Notch, which in my opinion is a good thing for not copying any brand. The phone features dual stereo speakers at the bottom and a headphone jack is still present in the device. Mi Max 3 pro will be running on MIUI 10 out of the box based on Android 8.0 Oreo. The phone will be available in two variants as per color, Black and Gold.